The Union County, SC Fowler families, as many families do, had a tradition of naming their offspring after themselves and their relatives. Although it is a respectable and common practice, it leaves us with many of the same names to sort out decades later. Ellis, Thomas, William, John, James, Gillman, Joseph, Henry, Lemuel…….. these were the often used names of the Union County Fowlers. All of this sorting out makes one happy to run across the random Ephraim, or Stephen, or Jasper. What follows is a very documented sorting out of the five Ellis Fowlers of Union County who lived there from the late 1700’s to the late 1800’s. Patriarch Henry Ellis Fowler is one of the five, as are his son Ellis, and three of his grandsons. The name Ellis is still used to this day for Henry Ellis Fowler descendants. HENRY ELLIS FOWLER 1746-1808 married Catherine Puckett; married Mary Puckett. Children: Ephraim, Ellis Sr., Mark, Godfrey, John, Womack, William, Nancy, and Henrietta. ELLIS FOWLER JR. 1810-after 1880 (son of Ellis Fowler Sr. and Mary; married Sarah Clark. Children: Elizabeth, Martha, Juliet, Jesse, Nancy, Thomas, Purchase, and Lotty. ELLIS FOWLER circa 1797-before 1840 (son of Ephraim Fowler and Nancy Moseley) m. Sarah Mabry. Children: Elbert, Henry Richard, Julia, and Mary Jane. For those who want documented facts and nothing less, please continue reading………. 1) HENRY ELLIS FOWLER: Patriarch to most of the present day Union County Fowlers and born circa 1746 in Virginia. Henry Ellis was married to Catherine Puckett (daughter of Ephraim Puckett). After her death circa 1800, he married Catherine’s sister Mary Puckett. Henry Ellis and Catherine had seven sons and two (or three) daughters. Henry Ellis Fowler was listed in two Union County, SC census records: 1790 and 1800. 1790 Union County SC Census: Henry Ellis was living next to his oldest son Ephraim Fowler. It is thought that some of the older males in the Ephraim Fowler household were his brothers. 1800 Union County SC Census: Henry Ellis Fowler still lived next to his oldest son Ephraim in 1800. 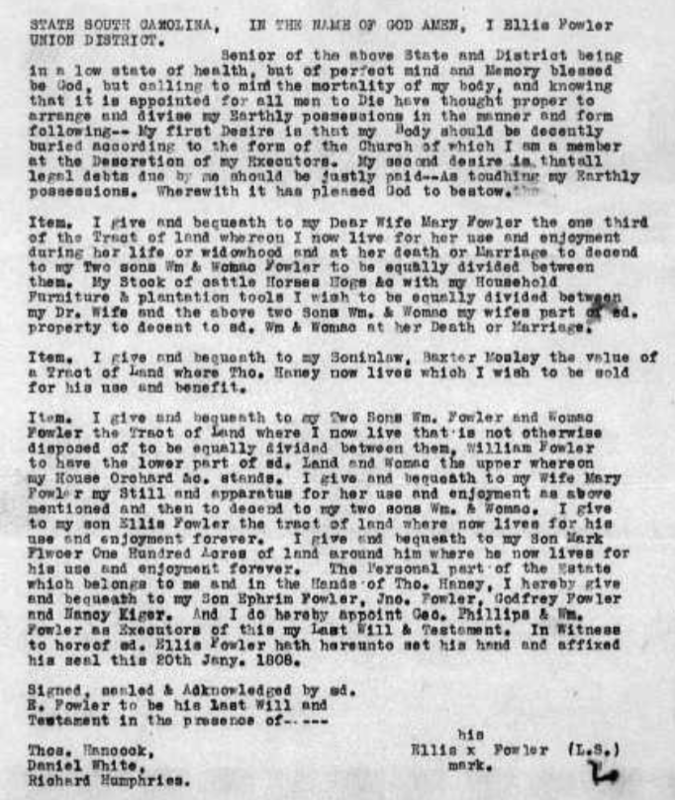 Henry Ellis Fowler signed his Last Will and Testament with an “X” on January 20, 1808, and he had died by February 16, 1808. 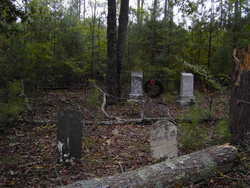 He is buried in the Joe Kelley Cemetery near Jonesville, SC. 2) ELLIS FOWLER, son of HENRY ELLIS FOWLER: Census records indicate that Ellis was born circa 1770 in Virginia. He died after 1850. He married Mary unknown, born in Virginia circa 1780. He first shows up in Union County census records in 1800, and is found in 1820, 1830, 1840, and 1850. Unfortunately, this Ellis Fowler is often overlooked by amateur genealogists. He was clearly mentioned in his father’s will…………. Ellis Fowler and wife Mary had several children, although the exact number is unknown to me. It is certain that they had son Ellis, Jr. and daughters Nancy and Winnifred. I have not been able to prove that they also had sons Reuben (b. 1797) and Andrew (b. 1804), and possibly a son named Thomas. I am still working on this. It is especially important research to me as Reuben Fowler is my great great great grandfather. 1850 Union County, SC Census: Ellis and wife Mary were living with their daughter Winnifred Fowler Worthy and her children. Winnifred was the widow of James Worthy. Ellis and Mary, unfortunately, did not leave wills, nor can I find any estate settlement for them. They were listed as “paupers” on the 1850 census, and perhaps had little to leave their offspring. Ellis Fowler died after the 1850 census, and was not recorded in 1860. 3) ELLIS FOWLER, JR. son of ELLIS and MARY FOWLER: Ellis Fowler, Jr. is found as head of household in census records in 1830, 1840, 1850, 1860, 1870 and 1880. He always lived next to or very near to his parents Ellis, Sr. and Mary. Census records have his age all over the place, showing his date of birth anywhere from 1795 to 1810. He died after 1880. He may have had a first wife who died young. By 1841, he was married to Sarah/Sallie Clark (daughter of Winnifred Clark) and they had children Elizabeth (b. 1841), Martha (b. 1846), Juliet (b. 1847), Jesse (b. 1849), Nancy Ann (b. 1854), Thomas (b. 1859), Purchase (b. 1860), and Lotty (b. 1863). 1830 Union County SC Census: Ellis Fowler, Jr. lived next to the Zachariah Reeves family in 1830. The older woman aged 40-49 was likely his mother Mary who was helping out with the two young children. I do not know if the female aged 16-19 was his young wife or his sister. It is possible that his wife had died. 1840 Union County SC Census: I feel certain that this is Ellis, Jr. if only by the location of the Zachariah Reeves family next door. I cannot explain the absence of the two children under the age of five listed in the 1830 census, nor can I explain the male aged 30-39 now living in the household. The female aged 16-19 could possibly be the new bride of Ellis Fowler, as he and wife Sally Clark had daughter Elizabeth in 1841. 1850 Union County Census: Ellis and his wife Sally Clark had four children in the previous decade, as shown on this census. Sally’s mother Winnifred Clark was living in the household. Their youngest son Jesse Fowler was likely named after Sally’s brother, Jesse Clark. 1860 Union County Census: Ellis and Sarah now had added 3 more children to their household, Nancy Ann, Thomas, and Purchase. Son Jesse was missing and probably had died as he is not to be found in any records after 1850. Sarah’s mother Winnifred Clark had either died or moved out of the household. 1870 Union County Census: Ellis and Sally had another daughter, Lotty, before the 1870 census. 1880 Union County Census: Ellis and wife Sally had not added any more children to their family, although their household now included Nancy Fowler, sister of Ellis, as well as 3 Jefferies grandchildren, Adolphus, Hettie, and Hester. 4) ELLIS FOWLER son of MARK FOWLER: Mark Fowler was the son of Henry Ellis Fowler and was born circa 1780; he died in Union County, SC in 1853; He is buried at Gilead Cemetery in Jonesville, SC. He was married to Elizabeth Moseley, daughter of James Moseley and Nancy Jasper. Mark and Elizabeth had a son named ELLIS FOWLER (b. 1803). I have only found him in two Union County, SC census records, 1840 and 1850. 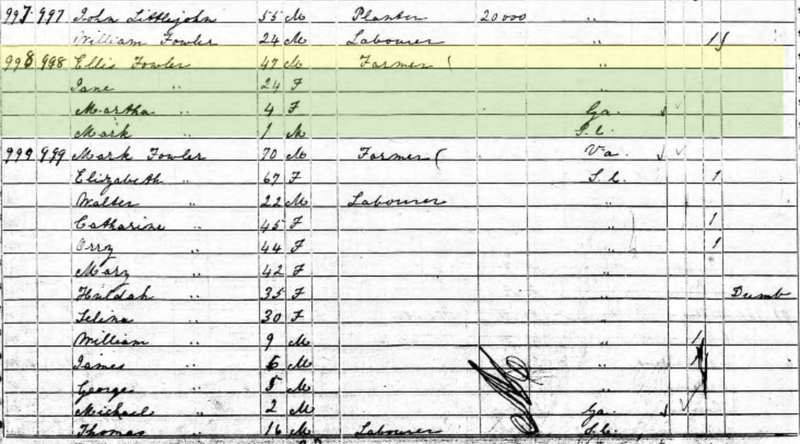 1840 Union County, SC Census: Ellis Fowler should have been listed in the age bracket of 20-29. Neither of the range of ages for the two adult men in the household is a good fit for our Ellis. However, I feel that this was the household of Ellis, son of Mark Fowler. The younger children may have been his, and the female aged 20-29 may have been his wife. Note of interest: Ellis was living beside Jesse Clark (and Jesse’s mother Winnifred Clark). Jesse was the brother of Sarah Clark who married Ellis Fowler, Jr. (son of Ellis Sr. and Mary). 1850 Union County, SC Census: Ellis is found in the Union County 1850 census living next to his parents Mark and Elizabeth Moseley Fowler. His wife, Jane Hodge, was the daughter of John Jackson Hodge and Martha Patsy Fowler, (daughter of Womack and Susannah Moseley Fowler). Ellis and Jane had at two children, a daughter named Martha (b.1846) and a son named Mark (b. 1849). Note also the William Fowler living with John Littlejohn. I have not been able to place this William Fowler into any Fowler family. 1860 Union County, SC Census: Ellis Fowler, son of Mark, may have died after 1850 and before 1860. In the 1860 census, his widow, Jane Hodge Fowler, had married Simeon Fowler (son of William and Rhoda Moseley Fowler; William may have been the son of John Fowler “the Elder” and Fannie). In addition to Martha and Mark, the children of Ellis and Jane, there were 3 more children in the household: Susan (b.1854), John (b. 1856), and Samuel (b. 1860). 5) ELLIS FOWLER son of EPHRAIM FOWLER: Ephraim was born circa 1765 in Virginia; he died in Union County in 1822. Ephraim married Nancy Moseley. Ephraim had ten children, including a son named ELLIS FOWLER. This Ellis was married to Sarah/Sallie Mabry, and they had four children: Elbert (b. before 1830), Henry Richard (b. 1826), Julia (b. 1828), and Mary Jane (b. 1833). How do we know that this Ellis Fowler married to Sarah Mabry was the son of Ephraim? Well, we know from his Last Will and Testament that Ephraim’s children were Jasper, Lydia, John, Sarah, Mary, Stephen, Milley, Caty, Ellis, and Betty. Ephraim’s daughter Mary “Polly” White was married to Richard White, who died in 1849. 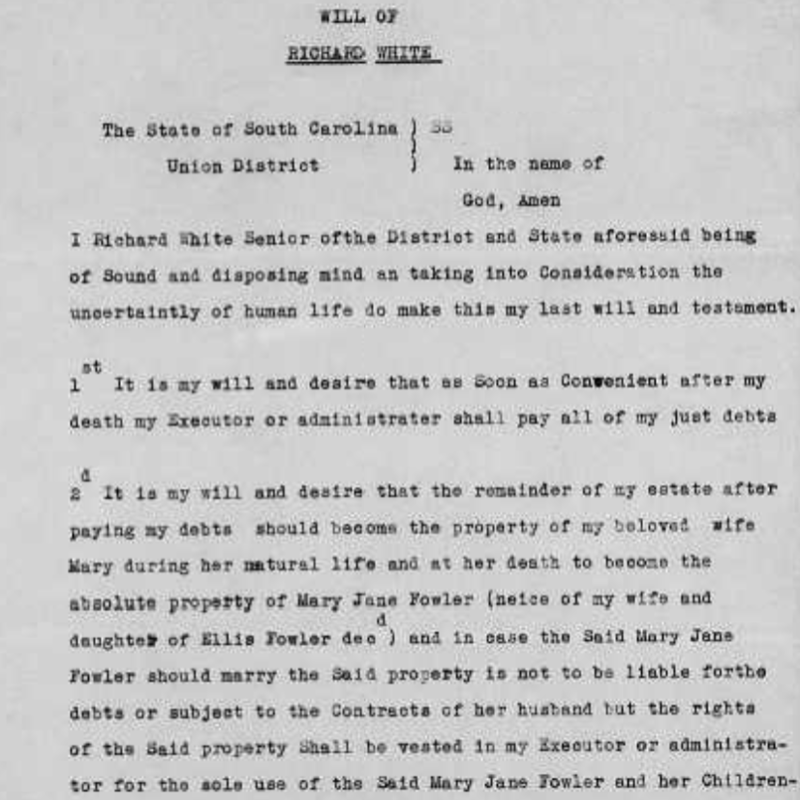 When Richard White’s will was probated, he left his worldly good to his wife Mary Fowler White, and upon her death, his estate was to go to his wife’s niece, Mary Jane Fowler, daughter of Ellis Fowler, deceased. So we know that Ellis had died before 1949. In fact, I believe that he had died between the time his daughter Mary Jane was born in 1833 and before the 1840 census when his widow Sarah Fowler was recorded as head of household. Further evidence supporting the fact that this Ellis was the son of Ephraim Fowler is the estate settle of Ephraim’s daughter Mary Fowler White who died in 1861. Her only living brother Stephen Fowler and his sisters Sarah Fowler Hames and Milly Millwood, along with the children of Mary’s deceased brothers (John and Ellis) and deceased sister (Lydia Fowler Hames) petitioned the court to have her estate settled. Ellis and Sarah’s children, Henry Fowler, Elbert Fowler, Julia Fowler Sprouse, and Mary Fowler Lipsey were among those petitioners, proving that this Ellis Fowler was the son of Ephraim. 1830 Union County SC Census: Ellis Fowler, son of Ephraim, and wife Sarah Mabry were living with his widowed mother Nancy in 1830. Nancy is head of household in the Union County census living with an adult man (Ellis) and adult woman (Sarah Mabry) and their three young children. (Note that Ephraim’s widow Nancy is living next to daughter Mary Fowler White (wife of Richard White) and near sons Jasper, Stephen, and John. Daughter Milly Fowler Millwood and husband James are listed in the census above Nancy, but not shown in this image). 1840 Union County SC Census: By 1840, Sarah (Mabry) Fowler is shown as head of household with her two daughters, Julia and Mary Jane. Ellis had died before 1840, and was never shown as head of household in any census record. Sarah and her children were living near her sister-in-law Sarah Fowler Hames and husband John Hames. 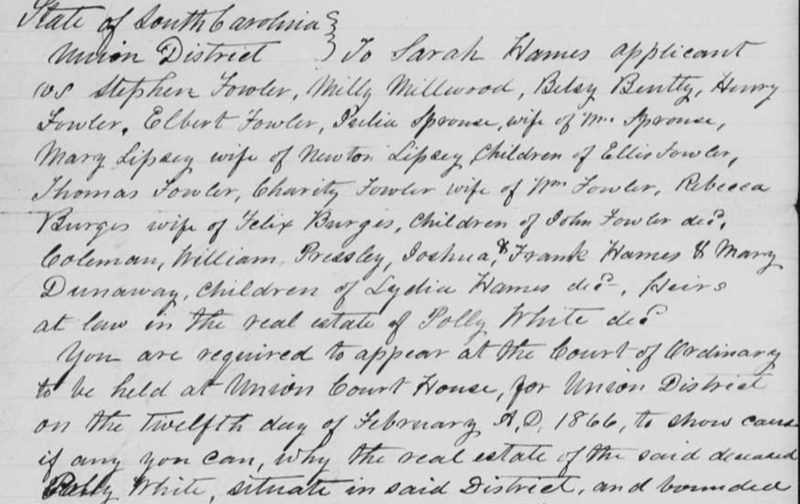 1850 Union County SC Census: In 1850, Sarah Mabry Fowler was head of household and living with son Henry Fowler. Her daughter Mary Jane Fowler was living in the household with her aunt Mary Fowler White. Daughter Julia Fowler had already married William Sprouse and was still living in Union County in 1850. I have not been able to locate son Elbert in 1850, but he and his family, as well as his sister Julia Fowler Sprouse and her family had moved to Cherokee County, Georgia by 1860. Beautiful! Clear, precise and logical. Keep up the good work. Fascinating……..so much detail! All Fowler descendants will applaud your perserverance!